I have LOVE loved this pattern ever since October Afternoon put it on a patterned paper at CHAW10. It was my favorite print from the show. But I didn't know what it was called. I have googled "quilt pattern" many times, but the number of patterns that type of search comes up with will boggle your mind, so I figured that quilt was meant for another bed. I can totally make that with paper. And I sounded just like my mother. ack! 1. 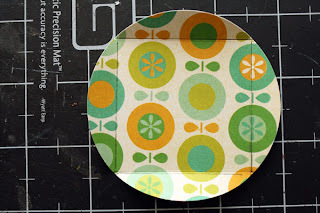 Trim circles from a patterned paper of your choice. Something to note: If you are using a two sided piece of paper, you will cut a lot of time and paper out of your project. You just need to determine if you would like to see both sides, and which side you would like to be the window, and which side you would like to have as the frame. 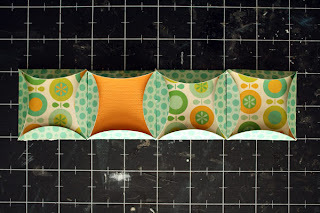 If you are using a single sided pattern, as I did, that's fine. 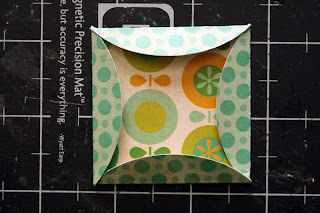 Just choose prints that you like, and trim circles from the print that will frame the window (in reference to my layout, trim a circle from the pattern that will be the manilla print). As for punches, I chose my 2 inch Marvy Circle punch so that I could have 6 across and have room on the outside edges, but odd numbers are usually more visually pleasing, so for this tutorial I chose to use my 3 inch circle punch. 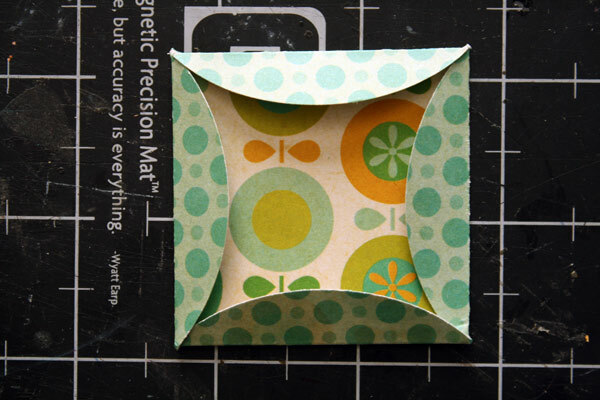 I wish I had used this punch or the 2.5 inch initially so you could better see the pattern of the paper in the window, but at the time, I was winging it, and wasn't sure what to do, lol. 2. 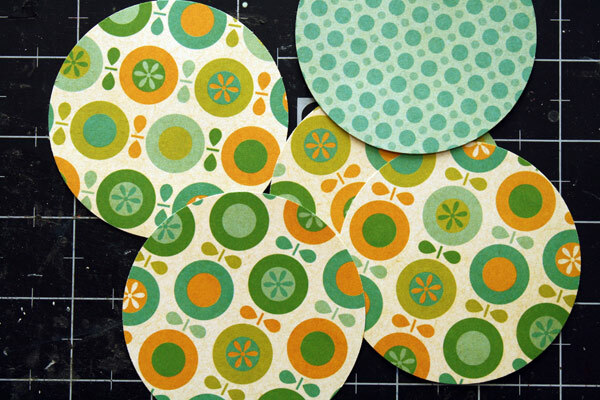 After you have trimmed several circles, it is time to score them. 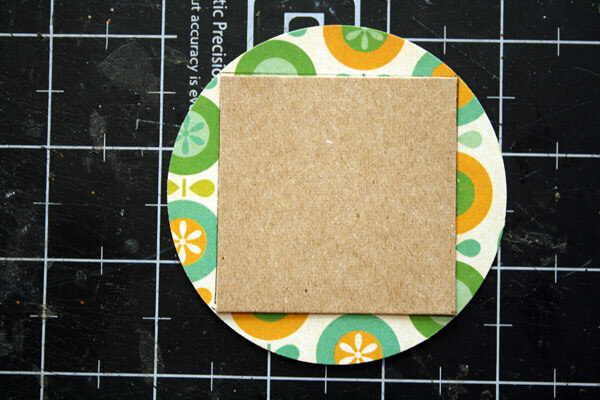 A 3 inch circle means a 2 inch square, and this is the long and drawn out way I did it. 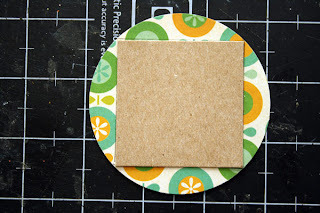 I trimmed a square out of a piece of chipboard, and traced it on my circles, which for me seemed much faster than lining things up and measuring. The outside corners of the square should meet an edge of the circle. I traced it on the side of the paper that will be the window (ie, if that piece of paper in my Polliwog layout was double sided, I would be tracing on the side with the little creatures). Keep in mind the orientation of the pattern on the paper, and make sure to trace the square so that the pattern has the correct orientation (the flowers are straight, stripes aren't crooked, etc). If you have a ScorPal, yay! If you have a scoring blade for your rotary cutter, yay! If you have a ruler and a bone folder from Making Memories that you have had since 1997, you will do just fine! I don't have a ScorPal, and couldn't find my scoring blade. So it was a ruler and a bone folder for me. And it worked just fine and dandy. Score the line that you traced. 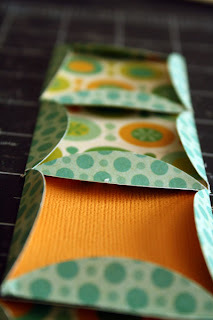 Folding the paper over takes away some of the width, and you want to try and match up corners on all four sides. If they don't, don't worry about it! I didn't! I made more circles than I needed and sent the bad ones to the round file, or hid them under my photo. Or I stitched on them. 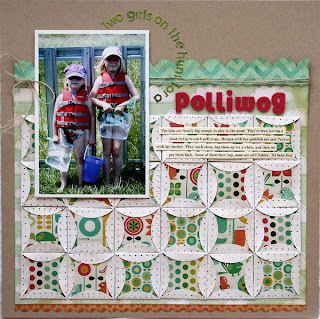 Quilts are homespun, handmade, and imperfect, so I can't expect my scrapbook layouts to be any different. 3. 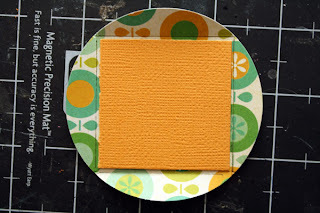 If you have a double sided patterned paper for this technique, skip this step. 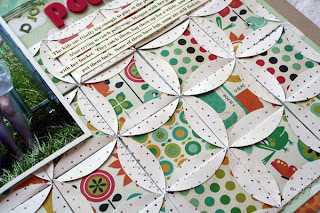 But if you didn't, or you want to create different patterns in your windows, at this point you need to trim squares out of those prints. 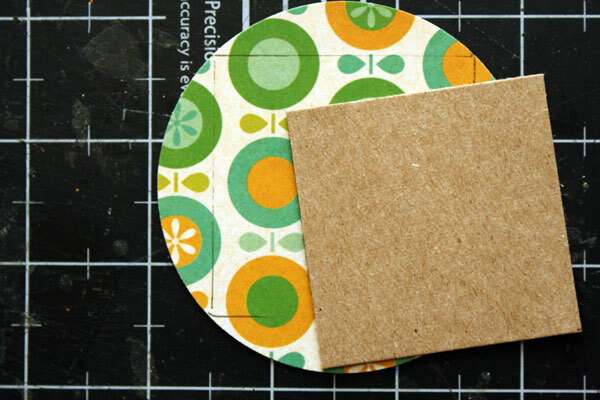 Make them 2x2, if you used a 3 inch circle. Do this with all your circles. 5. 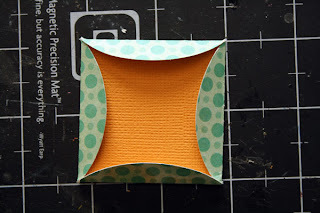 Once you are ready to put your layout together, line up your squares next to each other on your layout. 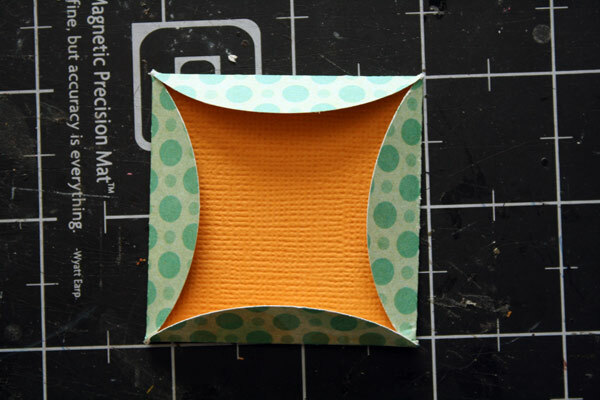 If you trimmed out squares, this would be the time to put them in their place on your layout. You simply slip the square under the folds and push them down again. After doing that you can add a glue dot, or a dab of glue under each flap, to adhere it. I stitched some of my squares down. I didn't want the layout to look too complicated, so I only did it a wee bit, for effect. Voila! The Cathedral Quilt pattern is now on a scrapbook layout, and it wasn't hard to make. It's cushy though. I like how the squares, all lined up, actually felt quilt-like. Have a great day! Let me know if you have any questions about this technique and I'll try and answer them in the comment section. P.S. If you use this pattern on a scrapbook layout, please be sure to give proper credit. Thanks! this is so cool! Thanks for the tutorial! Will definitely try this! Super! Thanks so much for doing the tutorial! I'll be trying this soon! Love your color combo! wow this looks so much easier than I was imagining! Thanks for the tutorial, I am right now making a note in my "ideas" book to try this someday! This is, quite frankly, brilliant. Thanks for the tutorial. I was wondering how you managed to fold the circles consistently. Great idea! This is fantastic, Davinie!! I'm definitely going to give this a try! Thanks for the inspiration. wow - so cool, thanks for the tutorial! 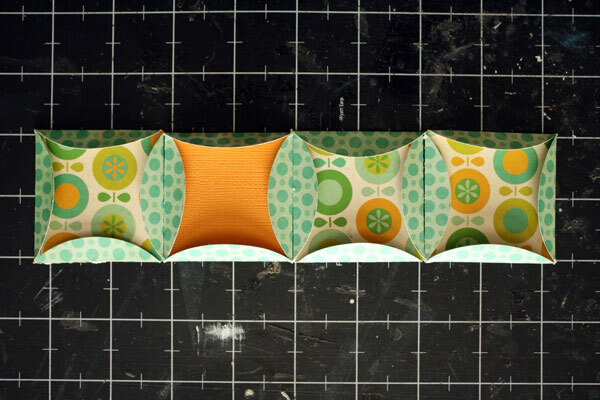 How lovely, i think it looks more like Japanese folded patchwork. 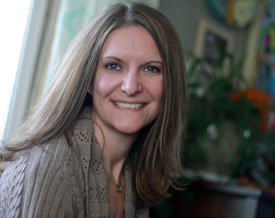 Wow this is amazing... thanks so much for sharing the how-to. I already scraplifted this, fell in love as soon as i saw it! don't worry I give all the credit for the idea to you! WOW! lovin this! thanks for making a tutorial!!!! I adore this layout, and thanks so much for sharing your technique. awesome technique. I will surely try this! I'm a part-time working Mom, a full time Grad student working on a degree in Elementary Education, married to my local firefighter, and raising two sweet girls on a couple of acres in Central Oregon. In my dreams I cut paper into bits.